Tammy and Dave are resident Innkeepers at Vine Cottage Inn and are thrilled to have the opportunity to continue the long history of exceptional hospitality for which the Vine is known. Between the two of them, Dave and Tammy have over 55 years of hospitality experience, both from the hotel and the restaurant perspectives. Dave started in the restaurant business in 1983 and has spent the last 35 years in various positions including server, assistant manager, general manager, and Managing Partner. The past 18 years have been with Outback Steakhouse where he acted as server, manager and ultimately Managing partner. Most recently, Dave served as a float manager helping to oversee operations at 5 different Outback locations. Tammy graduated from Michigan State University with a bachelor’s degree in Hotel, Restaurant, and Institutional Management in 1992. Her career in the hotel industry began in 1989 as a front desk clerk and ended in 2009 as a General Manager of a 181 unit condominium hotel. For the past 9 years, Tammy has been operating a before and after school program at the same elementary school where Tim attended. Through the use of her hospitality skills and business knowledge, Tammy has increased membership from 65 members a day to over 100 members daily. Dave loves to cook, so he will typically be found in the kitchen from which he will prepare your 3 course breakfast on our 1928 Magic Chef commercial stove. Since Tammy burns water, she is not allowed in the kitchen to help cook. However, she will serve your delicious breakfast with a hope and a prayer that you won’t be wearing it when she’s finished. Together, they both enjoy the challenges of maintaining historic properties so do not be surprised if you find both of them with tools in their hands. 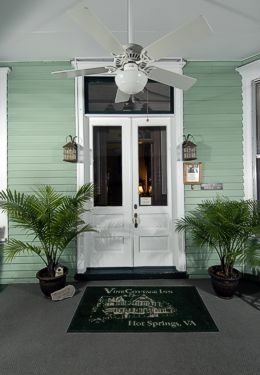 While they have not owned the Vine Cottage Inn for long, they have already made upgrades to the guestrooms and public areas with more to come in the near future. Both Tammy and Dave have knowledge of the area and can assist you with planning a day trip or recommendations for dinner. They are looking forward to meeting all their guests and demonstrating the exemplary guest service in which they excel.